OMG! Absolutely fantastic way to express the elegancy and decadency. LOVE IT. The man, the coat and the shoes. All to die for. This looks gorgeous! The color combinations make it attractive and alluring. This going to be a new trend setter. Very nice! Lots of character, yet somewhat subdued. I like the coat. 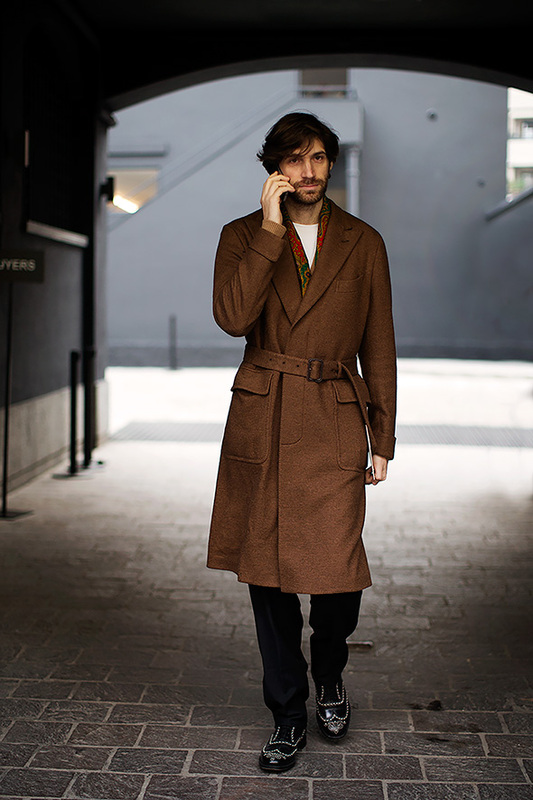 I do not like the shoes in combination with the coat and the navy blue trousers. Wow! Rock-Star, spy movie villain, bon vivant, international arms dealer, upscale hipster! Very nicely done sir. What a closet you must possess, to be able to throw that on with a tee-shirt, and stroll to the trattoria. Order me an espresso. I’m on my way. Personally I like how the colour way suggests nonchalance. But if they bother you….! The silhouette has it all. The scarf detail makes me melt. His hair is amazing. But the shoe combination is a tad too avant garde for my eyes. I can see why others love it but I just feel bewildered. What a handsome and stylish young man. Love it that his coat belt is not tied in a knot but the buckle is in use ! Quite a photo. please let me know where to buy this type of outfit. Dude they are taking of male costume not about kurtis or any kind ladies cotton printed dress material. I like it. The shoes add a bit of drama. Brown brogues or lace-ups would have been too matchy-matchy and predictable. Yes, please. I’ll take one to go…with me. What a great shot. This is something that I have looking for. Any gues that where can we printed cotton dress material becuase in India it’s hot and cotton is more suitable.